Cans of soup donated for the Souper Bowl of Caring are displayed at Cormorant Lutheran Church, Lake Park, Minn. Near Super Bowl Sunday, youth nationwide collect donations to help alleviate hunger and poverty. Cormorant collected 150 cans. Members of First Lutheran Church, Greensboro, N.C., show their team spirit while gathering donations of money and cans of soup for the Souper Bowl of Caring. The congregation has been participating in the Souper Bowl for 15 years. Donations are collected outside Cormorant’s sanctuary. The congregation raised $556 in its first appearance in the Souper Bowl. On Feb. 3, two teams will take to the field at the Mercedes-Benz Stadium in Atlanta for Super Bowl LIII. When they do, ELCA youth will have already taken to sanctuaries and fellowship halls across the nation collecting donations for Souper Bowl of Caring XXIX. Founded in 1990, the Souper Bowl of Caring is a national campaign that harnesses the energy of Super Bowl Sunday for good. On or around the championship football game, youth nationwide collect donations for charities of their choice. The playbook is different for each youth group, but the goal—alleviating hunger and poverty—is the same. In 2018, some 3,771 groups collected more than 8 million in cash and food for nonprofits leading the offense against hunger, according to the Souper Bowl of Caring website. The following three ELCA congregations were among them, learning a little teamwork can spark great generosity. Though the Souper Bowl of Caring is primarily led by youth, it takes congregants of all ages to pull it off. 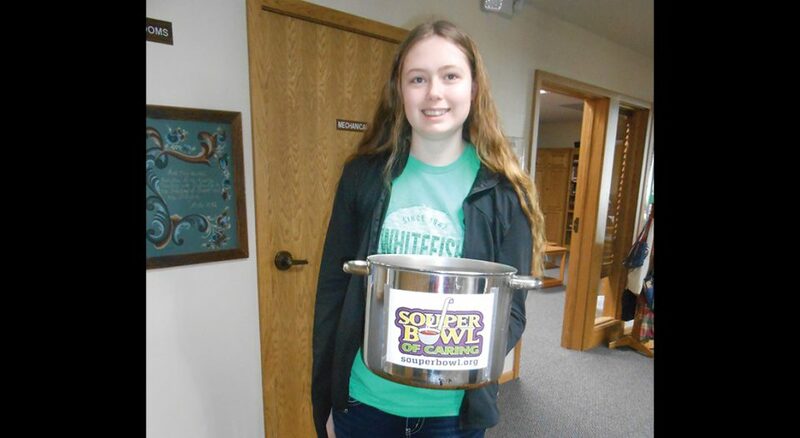 While planning their first appearance in the event, leaders of Cormorant Lutheran Church in Lake Park, Minn., were energized to discover that youth from Spring Valley Presbyterian, Columbia, S.C., led the first Souper Bowl of Caring years ago. “It came from kids themselves,” said Yvonne Steindal, a deacon who coordinates youth, family and educational ministries for Cormorant. So at Cormorant, kids as young as 3 got involved in the effort alongside high school students. For game day, Steindal encouraged families to bring a can of soup to represent each member of their family, including their pets. Youth also collected cash donations outside the sanctuary. The younger ones participated by bringing cans to the altar during the children’s message. People of all ages gave generously—Cormorant collected a total of 150 cans of soup and $556. On Souper Bowl Sunday at First Lutheran Church in Greensboro, N.C., members young and old show their team spirit for a worthy cause. “The younger children still enjoy putting on football uniforms or cheerleading outfits,” said member and hunger ministry leader Frank Moore. 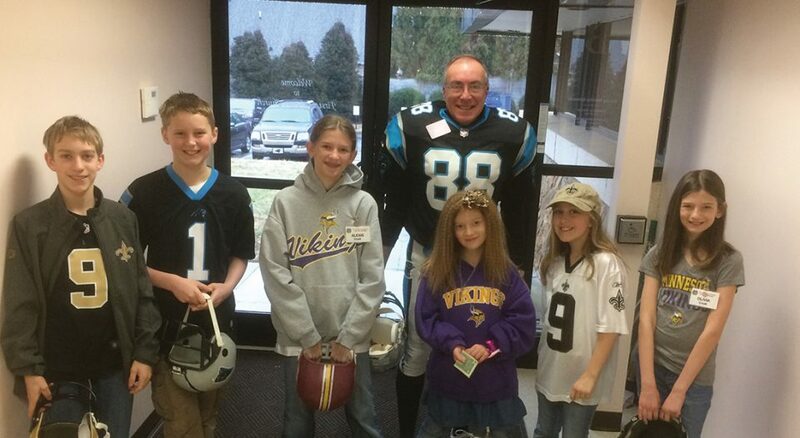 Then again, so do true blue-and-black Carolina Panthers fans—and congregants with other loyalties. “My husband is a Bears fan, and he comes decked out,” said Ginny Hultquist, who coordinates hunger ministries with Moore. Their congregation has been participating in the Souper Bowl for more than 15 years. Since 2003, they’ve collected a total of $21,000 and a thousand pounds of food. Hultquist said their long-standing commitment to fighting hunger stems from a desire to teach kids about faith. “We want to make sure our children grow up sensitive to the needs around them,” she added. Last year in Elizabethtown, Pa., Christ Lutheran youth director Sara Paine said her congregation celebrated the Philadelphia Eagles’ first Super Bowl win with a win of their own—$912 and 162 cans of soup to fight local hunger. “Many of the church’s members of all ages are Eagles fans, and it was heartwarming to see the church growing closer together,” said Lauren Duffitt, the youth representative on the congregation council. At Christ, members can donate soup for three weeks before Souper Bowl Sunday. Then on game day, youth raise funds through a friendly soup competition. In 2018, Philly cheesesteak soup (for the Eagles) and New England clam chowder (for the Patriots) were natural choices. Youth serve soup to members and hold cans to collect funds for each soup/team, encouraging their customers to donate to their favorite. Members know the amount raised by the end of the day, and Paine said neutrality is the toughest part for soup referees. “We tell them to judge the soup and not the team, but it doesn’t always go that way,” she said. 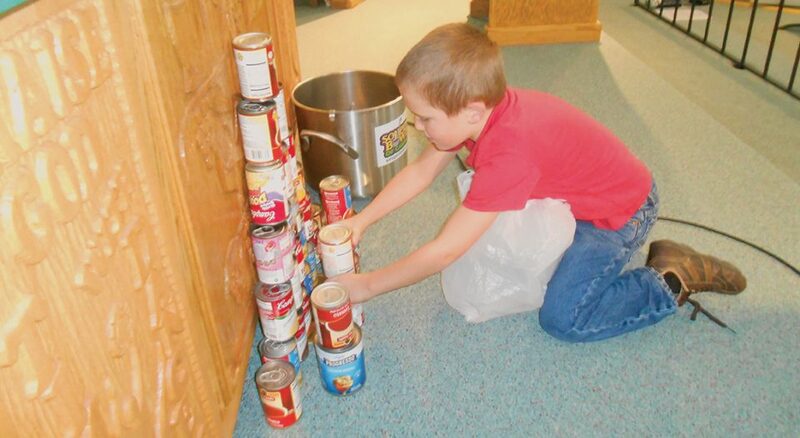 Souper Bowl collections are leading to fuller bowls in congregations’ neighborhoods. “For several years, we were the No. 1 place in the country for food insecurity,” Moore said of Greensboro. They’re not anymore. “We feel like our [congregation’s] efforts have made some difference,” he added. Youth at First also make a difference nationally and globally by annually sending a portion of Souper Bowl funds to ELCA World Hunger and a portion to local nonprofits. As they effect change in their communities, the youth themselves grow in faith. ELCA youth from Cormorant, First and Christ are participating in the Souper Bowl of Caring again this year, collecting soup and donations for a “souper” cause—to show Christ’s love to hungry neighbors.